The exposition of metallurgical history titled Metals – the Path of Civilization presents the technical and historical development of metallurgy, and its relationship with community life, influenced most of all by iron. 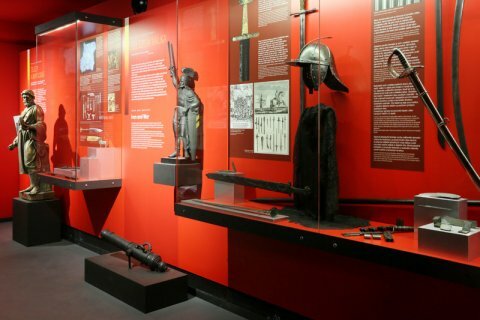 For that reason, the exhibit focuses primarily on ironworking. Development of iron-processing equipment is documented by a rebuilt Slavic smelter from the 9th century, and an original iron-mill. The development of iron metallurgy in all its phases is presented by a series of both models and authentic original equipment. The era of the industrial revolution, which had a significant impact on iron production and it use in engineering, transportation and construction, is shown by models of charcoal blast furnaces from the early 19th century, and a model of the Vojtěšská smelter in Kladno, with the first coke blast furnace from 1856. The most modern technology is shown by a model of the continuous steel casting process. The second part of the exposition consists of four sections, offering a view into the role of iron as it made its way into myths of nations in antiquity, became a symbol of war, but also served for useful and artistic objects. Currently, the metallurgical exposition in the National Technical Museum is the only synthetic exposition of metallurgy in the Czech Republic. In the museum building, it ties into the Mining exhibit, and shows how the two fields are quite closely related.